compassionate eyes and see Christ within (him/her/us, etc.). him in the Holy Eucharist, and present our request that (state petition). While we are not as materially destitute as those you served on earth, we reach out to you in the poorness of our souls and seek Jesus through you. Kindly Mother Teresa, help us. Agnes Gonxha Bojaxhiu, the future Mother Teresa, was born on 26 August 1910, in Skopje, Macedonia, to Albanian heritage. Her father, a well-respected local businessman, died when she was eight years old, leaving her mother, a devoutly religious woman, to open an embroidery and cloth business to support the family. After spending her adolescence deeply involved in parish activities, Agnes left home in September 1928, for the Loreto Convent in Rathfarnam (Dublin), Ireland, where she was admitted as a postulant on October 12 and received the name of Teresa, after her patroness, St. Therese of Lisieux. Agnes was sent by the Loreto order to India and arrived in Calcutta on 6 January 1929. Upon her arrival, she joined the Loreto novitiate in Darjeeling. She made her final profession as a Loreto nun on 24 May 1937, and hereafter was called Mother Teresa. While living in Calcutta during the 1930s and ’40s, she taught in St. Mary’s Bengali Medium School. On 10 September 1946, on a train journey from Calcutta to Darjeeling, Mother Teresa received what she termed the “call within a call,” which was to give rise to the Missionaries of Charity family of Sisters, Brothers, Fathers, and Co-Workers. On 1 February 1965, Pope Paul VI granted the Decree of Praise to the Congregation, raising it to pontifical right. The first foundation outside India opened in Cocorote, Venezuela, in 1965. The Society expanded to Europe (the Tor Fiscale suburb of Rome) and Africa (Tabora, Tanzania) in 1968. From the late 1960s until 1980, the Missionaries of Charity expanded both in their reach across the globe and in their number of members. Mother Teresa opened houses in Australia, the Middle East, and North America, and the first novitiate outside Calcutta in London. In 1979 Mother Teresa was awarded the Nobel Peace Prize. By that same year there were 158 Missionaries of Charity foundations. Mother Teresa spoke at the fortieth anniversary of the United Nations General Assembly in October 1985. On Christmas Eve of that year, Mother Teresa opened “Gift of Love” in New York, her first house for AIDS patients. In the coming years, this home would be followed by others, in the United States and elsewhere, devoted specifically for those with AIDS. From the late 1980s through the 1990s, despite increasing health problems, Mother Teresa traveled across the world for the profession of novices, opening of new houses, and service to the poor and disaster-stricken. New communities were founded in South Africa, Albania, Cuba, and war-torn Iraq. By 1997, the Sisters numbered nearly 4,000 members, and were established in almost 600 foundations in 123 countries of the world. After a summer of traveling to Rome, New York, and Washington, in a weak state of health, Mother Teresa returned to Calcutta in July 1997. 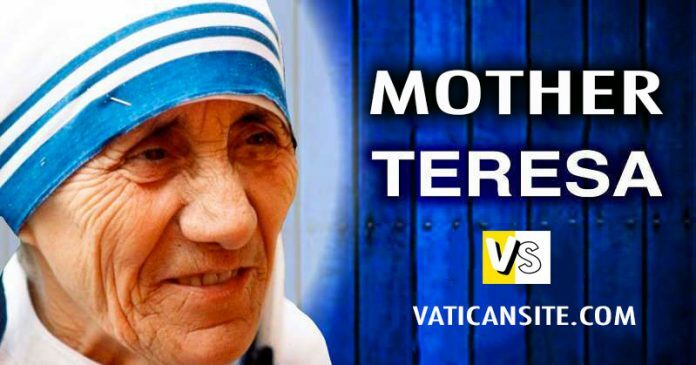 At 9:30 PM, on 5 September, Mother Teresa died at the Motherhouse. Her body was transferred to St Thomas’s Church, next to the Loreto convent where she had first arrived nearly 69 years earlier. Hundreds of thousands of people from all classes and all religions, from India and abroad, paid their respects. She received a state funeral on 13 September, her body being taken in procession – on a gun carriage that had also borne the bodies of Mohandas K. Gandhi and Jawaharlal Nehru – through the streets of Calcutta. Presidents, prime ministers, queens, and special envoys were present on behalf of countries from all over the world.